Could be the amazing food, your type of atmosphere, the friendly service, or a combination of everything. 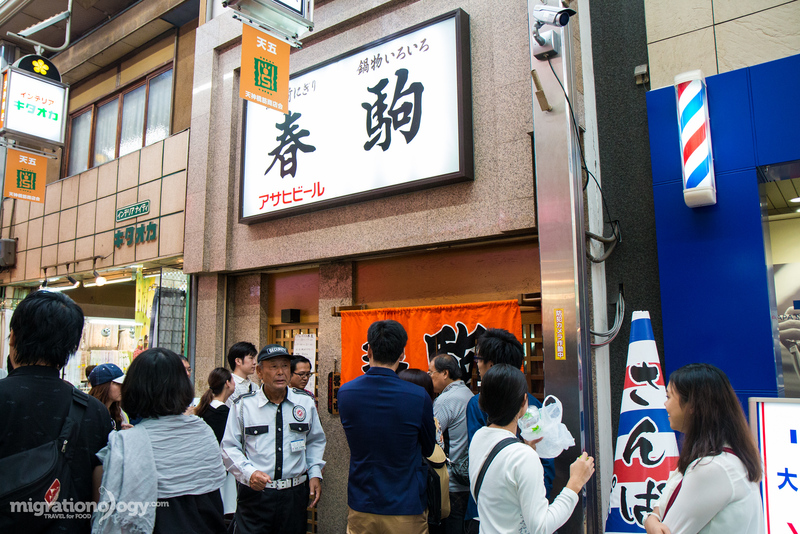 Harukoma Sushi (春駒 支店), a well known sushi restaurant in Osaka, Japan, is one of those restaurants that had me smiling from the moment I joined the queue to get in, until the moment I took my last bite (and I was still smiling, I was just a little sad when it was all over). There’s a lot of incredible food worth going to Osaka to eat, but if you’re a sushi lover, Harukoma Sushi (春駒 支店) is one of those places that is singlehandedly reason enough to consider going to Osaka for. I can honestly say that I wasn’t all that excited to walk around Tenjinbashisuji Shotengai, which is Japan’s longest shopping street. But my wife and her sister wanted to do some shopping, and so I decided to accompany them. Little did I know that part way down the street, while being a little overwhelmed by all the shopping, my eyes would glance upon a line of people huddled around an unpretentious looking front door, with some orange hanging banners. My mind raced through some images, and I suddenly knew I had seen the sign and outdoor area of the restaurant in a photo while doing online research on where to eat in Osaka – could have been from Foursquare (Note: I think there are two locations, and I saw both, but went to the one on the main walking street). Harukoma Sushi (春駒 支店) was a restaurant that I had looked up, thought it was a place I needed to check out, but then scratched the idea because we didn’t have much extra time left in Osaka. But there it was right before me, by chance… or maybe it was meant to be! “We need to get in line immediately,” I told my wife. And luckily, she’s incredibly understanding of my passion for food, and so the shopping came to a halt and we got in line. There were probably 20 or so people waiting in line, and it was late afternoon. Luckily the line moved quite quickly, and in just 15 minutes, the guard opened the door and lead us in. Immediately the atmosphere of the restaurant transformed to a feeling like we had just gone from a clothing market to a fish market. The restaurant was loud and bustling. From outside it looked like it might be a tiny little hole in the wall restaurant with just 5 tables inside, but to my surprise it was huge (not space huge, but production huge), and there were multiple floors of seating. At the very front, as we entered, there were about 10 sushi chefs slicing away and expertly putting together platters of sushi. There was also a sushi bar, and then at the back was a room, kind of a shophouse style room, where we got a table. Additionally, from the moment we stepped into the restaurant, the service was kind and friendly, and even though it was packed and the waiters and waitresses were busy, they smiled and did everything they could to speak in English. Sometimes you go to restaurant in Japan, and if you don’t speak or read Japanese, you’ve just got to order whatever you see (or you might order a plate of chicken sashimi without knowing it!). But at Harukoma Sushi (春駒 支店) they had a nice laminated menu of all the different types of sushi and sashimi they had, written in both English and Japanese, and clearly labeled and priced, and even a little description of each. I wrote down our order and the amount that we wanted on a piece of paper, and then handed it to our waitress. 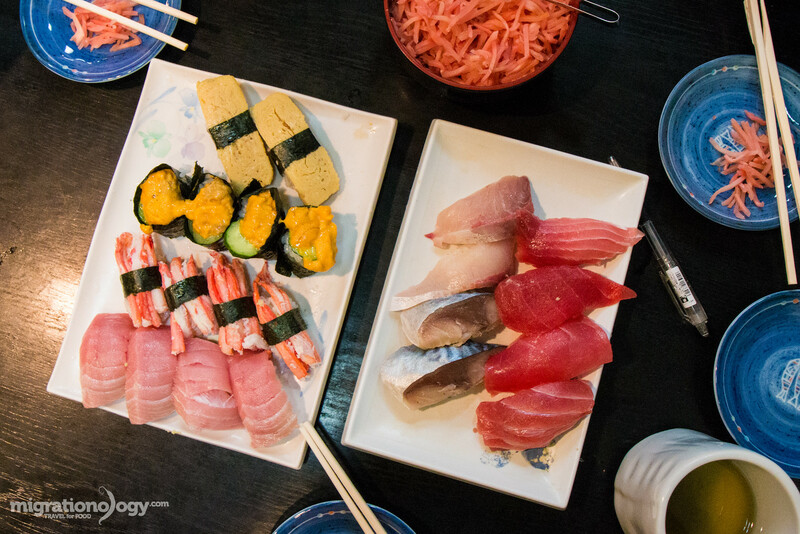 You order as much of any kind of sushi or sashimi that you want, and the sushi chefs make up the sushi, and put everything onto communal plates – which can easily be shared and enjoyed with your friends or family (or whoever you eat with). 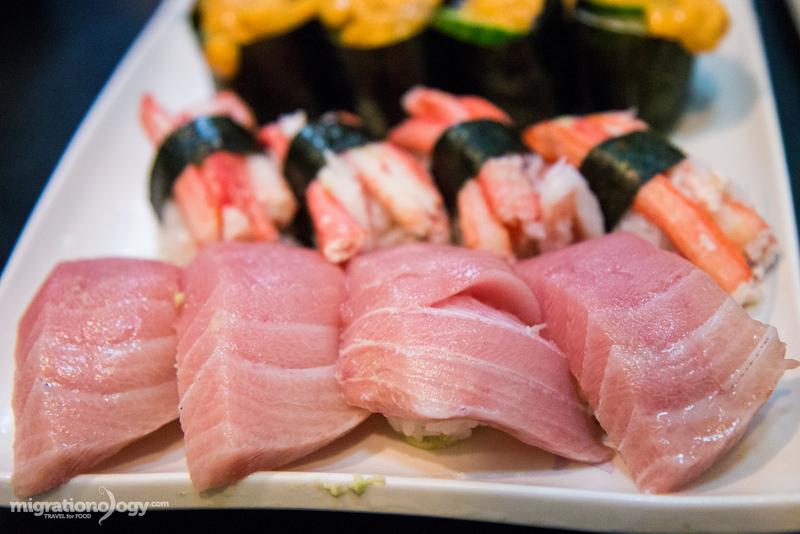 The first plate included a row of akami, which is the red meat of the tuna, and another row of mackerel. On the second plate we got tamago (egg sushi), uni (sea urchin), crab, and finally a row of tuna belly – something I just can’t get over how good it is. What I immediately loved before even taking my first bite, was that nothing was fancy, it wasn’t too arty or fake looking, but the sushi included just big and bulging, roughly cut slices of seafood. My kind of style. I saw the toro on the menu and had get some. The creamy white and pink slabs of tuna belly were thickly sliced and placed over a ball of rice, possibly a 3:1 ratio, the rice smothered by the tuna belly! 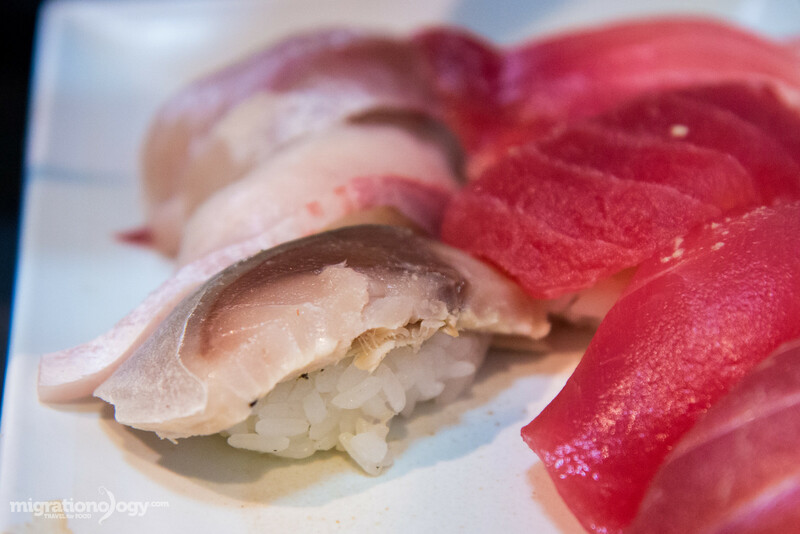 Just like eating that unbelievable tuna at the Izakaya in Osaka, the tuna belly sushi at Harukoma Sushi (春駒 支店) was insanely good – just melt in your mouth – like slices of fish flavored butter. I ordered some maguro, which I believe just means tuna, and it came as the red meat. 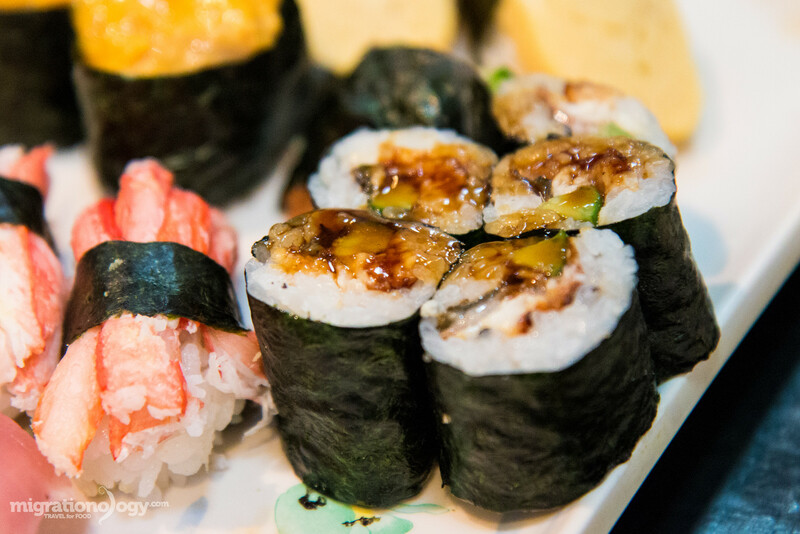 It’s always a good fish and sushi to order. Again, big tender slices of fish, good rice, and just overall excellent. I’ve had good and I’ve had bad sea urchin. When it’s good, it’s really good, and when it’s bad, it’s really bad. This was really good sea urchin, and it was served overflowing on each piece of sushi. 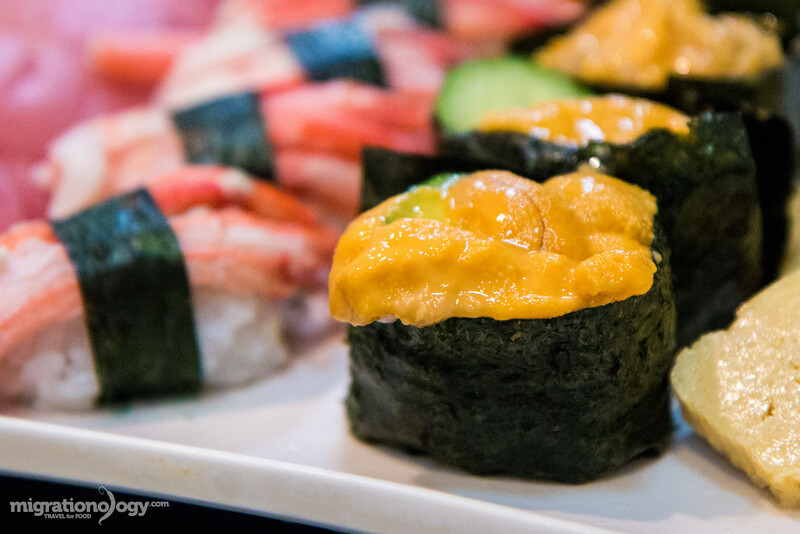 The uni had just a faint seafoody flavor with an ultimate custardy texture, not unlike a perfect durian, and it blended into the rice and seaweed. It was stunning, not to mention beautiful to look at. 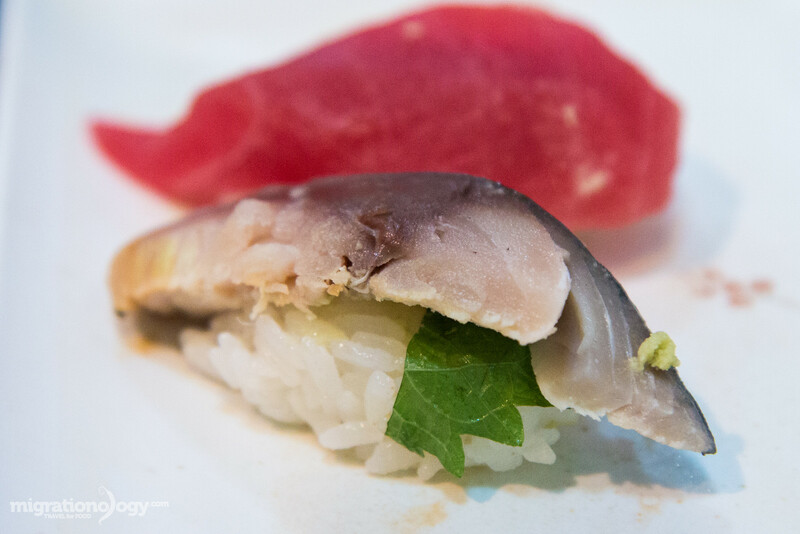 Mackerel, or saba, is another good sushi option that I always enjoy. The saba had a much different texture from other fish, more of an almost chicken breast texture. It was more grainy and not slimy at all. It was salty, and and then underneath the piece of fish there was a small slice of shiso leaf to give it a green nutty taste. I’m not even sure if I remember which one the yellowtail tuna was, but if I remember correctly it was white in color, and it wasn’t nearly as soft or melt in your mouth as the maguro. But it was still delicious. The yellowtail is on the back of the plate (unfocused, sorry about that). Another favorite piece of sushi for me at Harukoma Sushi (春駒 支店) was the kani, crab sushi. The crab was cooked, so it wasn’t slimy, and it was flaky and sweet. 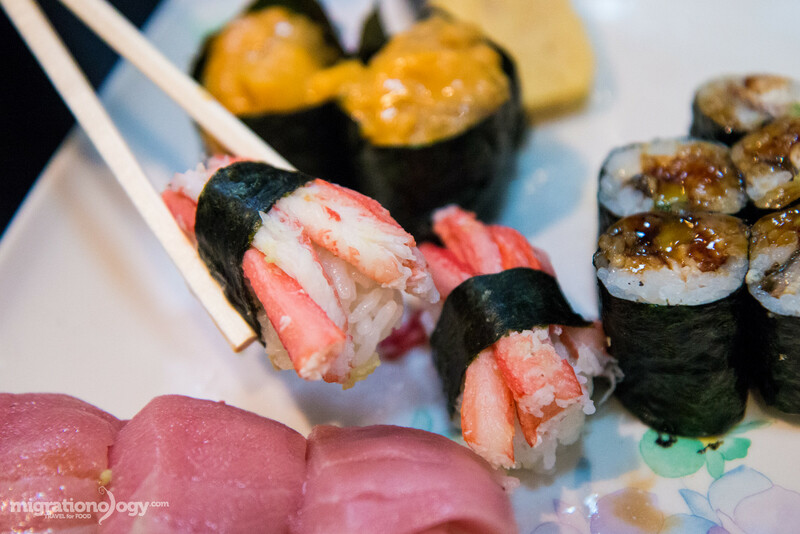 Just like the fish, they were very generous with the amount of crab added to each piece of sushi. Even though I had previously taken a trip to Japan, I had never tried natto, Japanese fermented soy beans. I saw it on the menu, within a hand roll, and I had to try it. The natto was very interesting, and to me it didn’t have all that much taste, but it was all about the texture, which was undeniably sticky and even had some elasticity to it. I started chewing and it was like my bites didn’t go anywhere – almost like chewing a piece of gum. I had to take some swigs of tea to wash it down. I did enjoy it, for it being so interesting, but I don’t think it’s something I would crave. 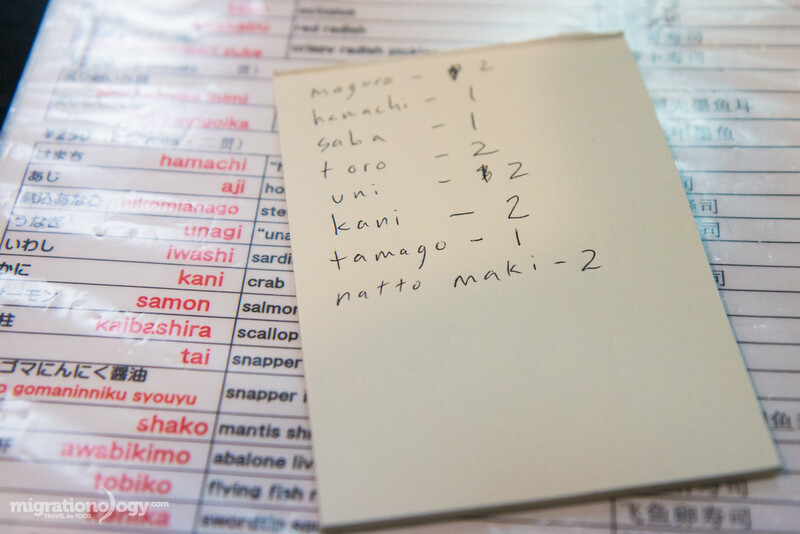 During our meal, we made another couple of sushi order, because it was so good, and I didn’t want to stop. We had some unagi rolls (eel rolls), some salmon roe rolls, and a few others which I’ve probably already forgotten, but that I thoroughly enjoyed. Finally, to end the meal at Harukoma Sushi (春駒 支店), I could not resist ordering one negi-toro maki, a minced tuna belly hand roll. 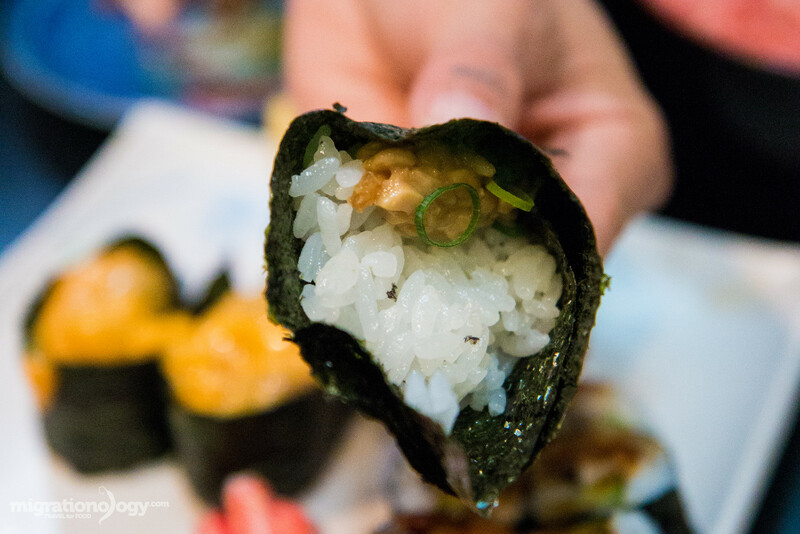 The seaweed was so fresh and crisp, the rice was sticky and perfect room temperature, the green onions gave it all some crunch, and the minced up tuna belly was rich and oily. It was an ultimate way to end an ultimate sushi meal in Osaka, Japan. One of the things I loved about Harukoma Sushi (春駒 支店), and judging from how busy they were, a lot of others thought the same, was the price for quality. For the price, the sushi was fantastically fresh and the portion sizes were very generous. Our total bill for everything we ate for 3 of us, came to just 4,000 Yen ($33.15), which I think is an incredible deal. I’m not sure where else in the world you can eat that kind of quality and quantity of sushi for that price. On top of that, this is one of the few sushi restaurants where you can actually go there to eat, and come out full, rather than one of those sushi restaurant where you finish your meal still hungry. 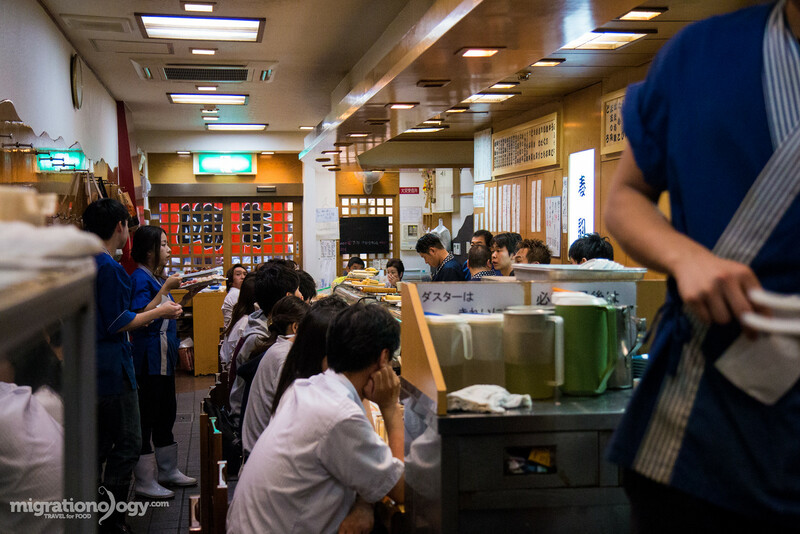 No matter if you visit Tokyo or Osaka, undoubtedly one of the best reasons to visit Japan is to eat. 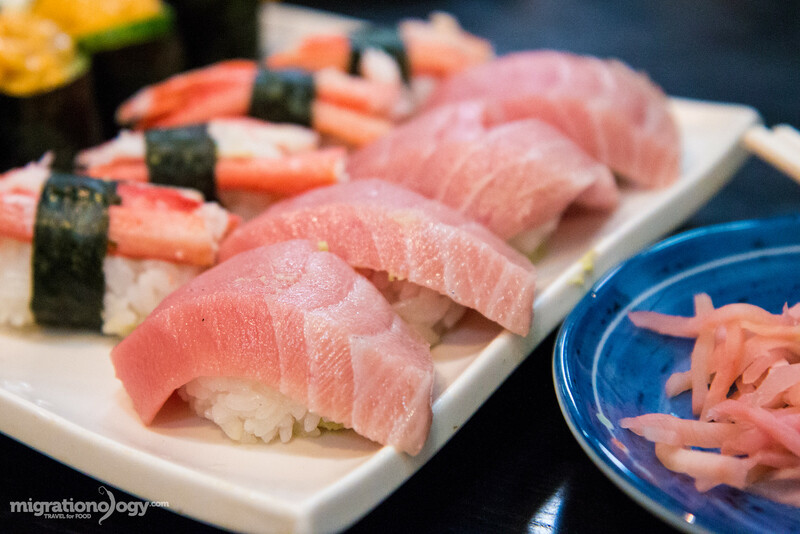 And one of the main things that’s worth traveling to Japan just to eat is sushi and sashimi. In Osaka, I had a chance to try a sushi restaurant called Harukoma Sushi (春駒 支店), and it turned out to be one of my most memorable sushi meals ever. Atmosphere / Friendliness – It felt like a fish market inside, it was loud, bustling, and filled with food lovers. And the staff were all very helpful and friendly as well. 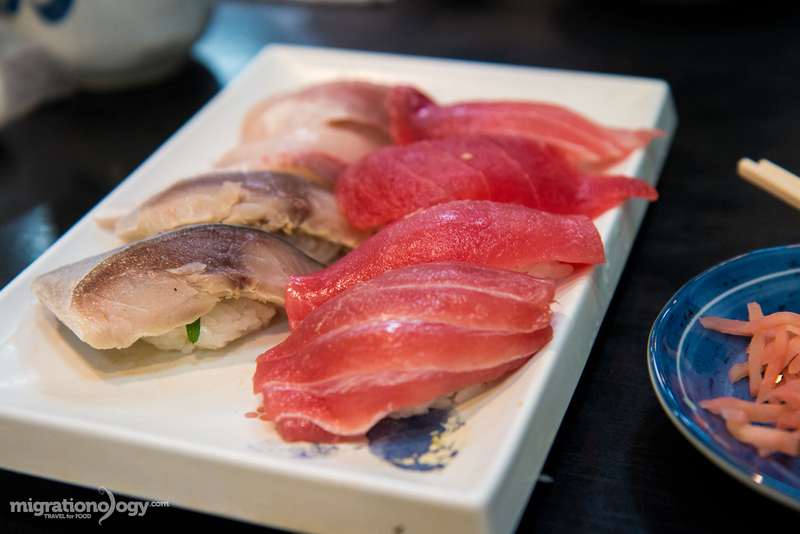 For delicious, not fancy, and great value sushi in Osaka, Harukoma Sushi (春駒 支店) is a place you need to check out. How to get there: The restaurant is not far from either Temma JR station or Ogimachi Subway Station, in Osaka, Japan. It’s located along Tenjinbashisuji Shotengai shopping street. I’ve watched both this video and the video of you going to Kobe. For a half day trip which place would you recommend more? Nara or Kobe? Thanks Jerry, that sounds amazing, will try next time. Hi, will be there in Feb 2017 & would love to try this ! Anyway, i assume this kind of restaurant only accept cash ? Hey Barkley, awesome to hear that. I’m not totally sure, but probably best to have cash just in case. A very nice info blog. 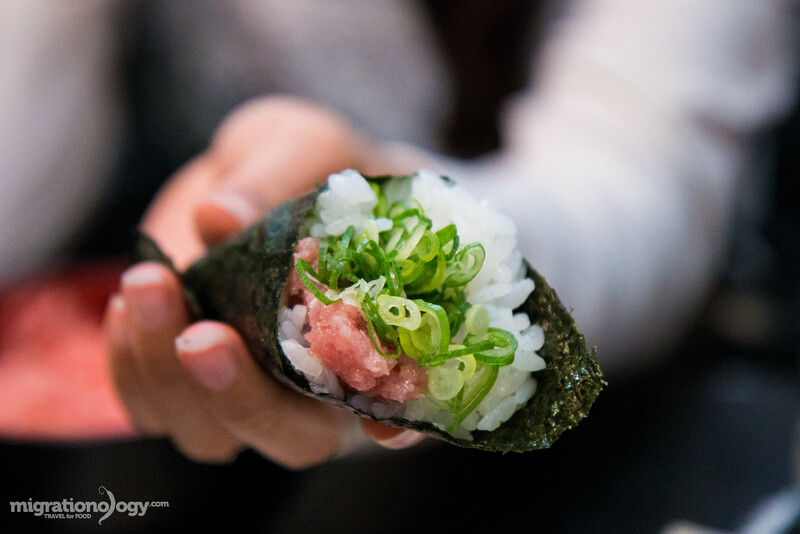 Well, one question have you ever tried Hiro Sushi in Tokyo ?? Thank you very much. No, I haven’t had the chance to go to Jiro sushi yet. Thanks. This will an excellent guide for my next visit to Osaka in November. I’m so hungry now. Holy moly, that sushi looks amazing. Thanks for recommending this gorgeous sushi restaurant. Last december, my girl pals and I chanced upon this lovely eatery whilst shopping at tenjinbashi and I swear I had a deva-ju *cues watching migrationology youtube video on harukoma sushi* and I immediately shrieked and dragged my girls over. The sushi is worth every bite and I really love the atmosphere of the place. The chefs and servers were pleasant and kind with us trying to decipher the amazing menu because there were just so many choices to choose from, we really took a while to place our order. I can still remember the taste of the massive unary sushi i had and it was really top notch! For those who are interested in eating here, be on the alert because on the outside, it really looked pretty quaint but once you enter, it’s like you’re transported to a sushi world. Love it here, I will definitely go back for more! Hey Nameera, thank you very much for the comment, glad this post brought back some great memories, and that you had such an amazing experience eating here too. That’s exactly how I felt eating here – amazing food, friendly staff, energetic and authentic environment. Thanks! Hello Mark, my boyfriend and I are planning a trip to Japan and we wanted some advise about affordable places to eat while in Japan. I love your videos and they are super entertaining. Also, we were thinking about blogging and vlogging our experience and we wanted some tips on how to do so. We’re going to check it out in May 🙂 Can’t wait!!! Thanks Ana, glad you’ll be going to Osaka! Thanks Carmen, hope you can visit Japan. Omg that look really nice! Grrr now im so hungry!!! 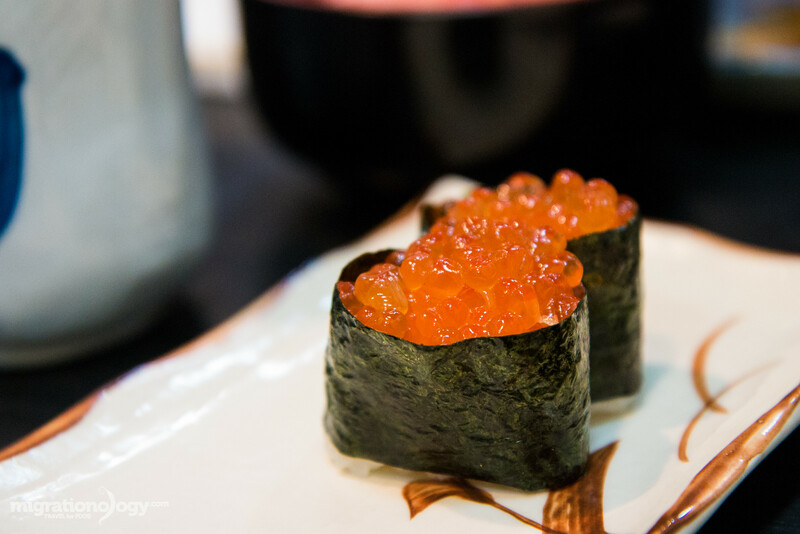 My mouth watered reading this article … Japan is a dream destination for me! This sushi looks absolutely incredible! 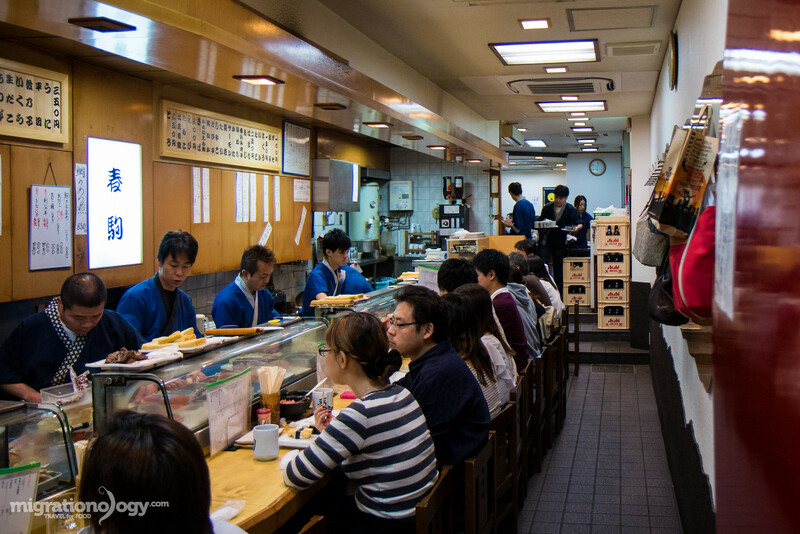 Eating sushi in Japan is high on my travel wish list, even more so after reading this post! And so brave of you! Natto Maki ! This place looks amazing. I’m planning a trip to Japan in October and I’ll have to make a note of it. And you’re right – that’s an incredible price for all the sushi! Thanks for the find, Mark!